ARCOR Tumbleweed Classic September 8th-10th. Notes: Saturday will consist of 3 rounds of rocket round qualifying. We hope to have the program wrapped up by 5-6pm. Notes: Sunday will consist of a final qualifier and all mains. We hope to have the program wrapped up by 4-5pm. Race schedule and format are more or less detailed on RC Signups. Class race format and details may change due to low turnouts per class. Please sign up early so that we can establish and publish a more accurate race program. We will be running qual points and all results will be available via LiveRC. 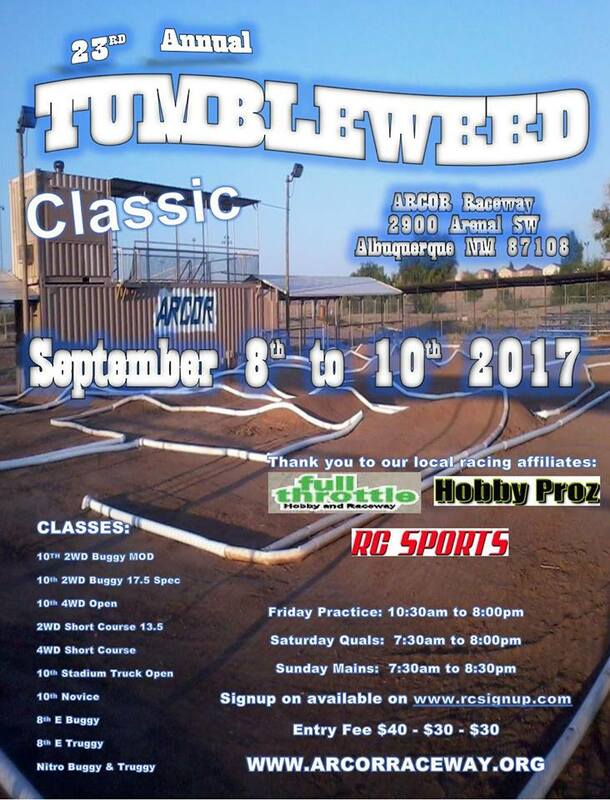 ARCOR RACEWAY. Travel theme. Powered by Blogger.